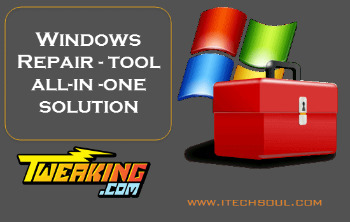 Tweaking.com – Windows Repair portable is a tool designed help fix a large majority of known Windows problems including; registry errors, file permissions, issues with Internet Explorer, Windows Updates, Windows Firewall and more. Malware and poorly installed programs can modify your default settings resulting in your machine working badly – or worse. With Tweaking.com Windows Repair you can restore Windows original settings fixing many of these problems outright. Tweaking.com – Windows Repairs section as always been completely free for both personal and business use. We offer a Pro version. adds features like automatic updates, an enhanced drive cleaner, memory cleaner, speed tweaks and more. This allows you to support future development and get something in return! There is a bug in Windows 10 build 1809 where using the bcdedit command to reboot the system into safe mode doesn’t clear the registry keys for the safe boot option after the command has been removed. Because of this when you reboot into normal mode many services wont start because Windows thinks it is still in safe mode even though it isn’t. This kept almost everything from working correctly.